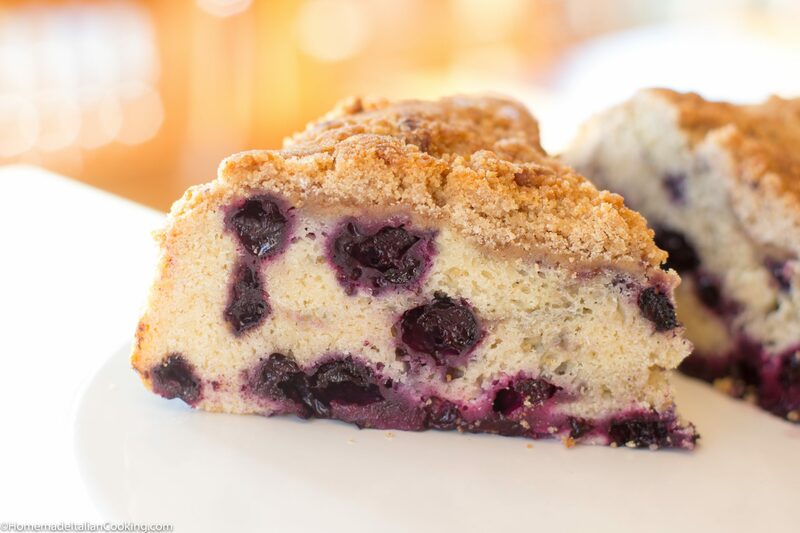 Blueberry Crumble Coffee Cake is a wonderful way to brighten up a rainy Spring morning! What makes this coffee cake special is the heavy-handed brown sugar crumble topping. The blueberries are a perfect tart contrast to the crumble and creamy cake. You can use fresh blueberries or frozen (do not thaw). The blueberries used in the cake pictured were frozen from last summer, a wonderful batch from my cousin Aggie’s blueberry farm in Indiana. What type of pan you use will make a difference. 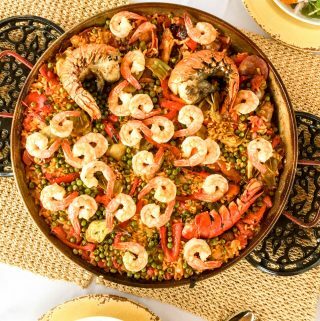 In this recipe I used a 10-inch Springform pan. I like the easy release of the cake in a springform. The classic recipe calls for 9-inch square baking pan. A smaller pan, such as an 8-inch square baking pan or 9-inch round, will result in a deeper cake. Whatever your preference. 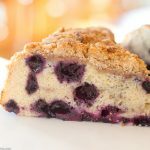 The hardest part of making a Blueberry Crumble Coffee Cake is gently folding in the blueberries evenly without getting blue streaks. It won’t hurt the flavor at all if they break up a bit. As you can see here I did not do that great a job at it! The spiced crumble topping adds a layer of sweetness and flavor as well covers up the jumble beneath. Give Blueberry Crumble Coffee Cake a try this weekend for your family. Blueberry Crumble Cake is a wonderful way to brighten up a rainy Spring morning! What makes this coffee cake special is the heavy-handed brown sugar crumble topping. The blueberries are a perfect tart contrast to the crumble and creamy cake. 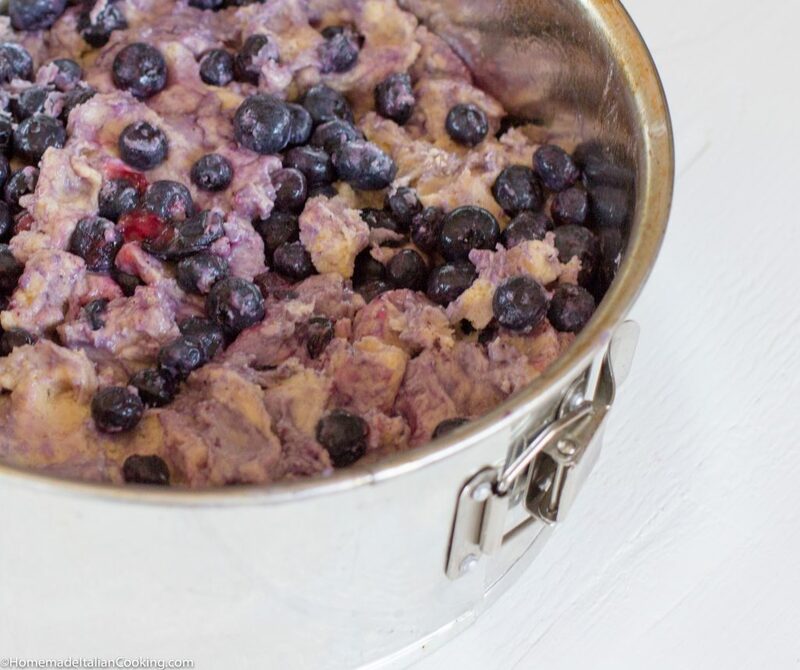 You can use fresh blueberries or frozen (do not thaw). Grease a 10-inch springform pan with butter or spray baking oil. Place the springform pan on a baking sheet for easier handling in and out of the oven, and to catch any possible spills. In a small bowl, sift together the flour, baking powder, salt, and cinnamon. In the bowl of a stand mixer, cream the sugar and butter for 3-4 minutes until pale and creamy. Add the egg and vanilla and mix well. Add the flour third at a time, alternating with a third of the buttermilk. mixing after each addition. The dough will be thick. Using a spatula, gently fold in the blueberries until evenly incorporated. 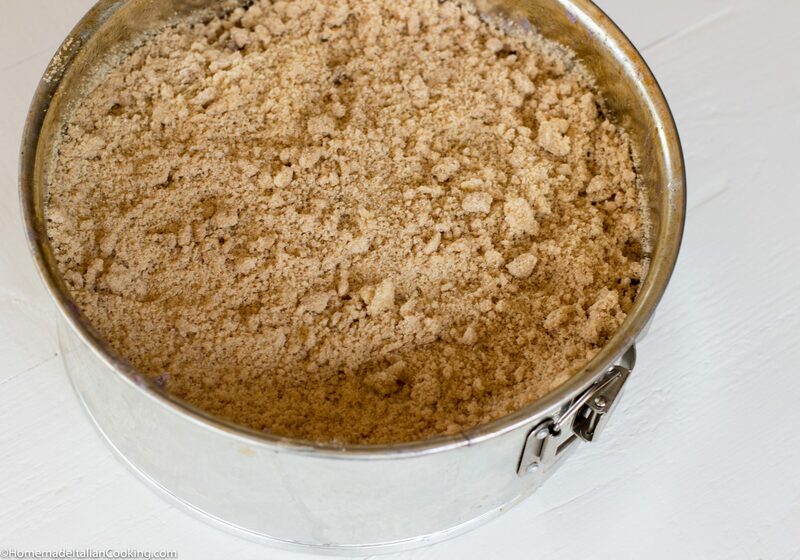 To make the crumble, whisk all the dry ingredients together in a medium bowl. Break the softened butter in pieces with your hand and mix/squish into the sugar mixture until crumbly. The crumble will end up with little bits of butter coated in sugar. Sprinkle the crumb topping over the cake batter. Bake for 50 -60 minutes or until a cake tester comes out clean in the center, and the crumble is golden brown. Let cake cool for 30 minutes.Release from springform pan before serving.